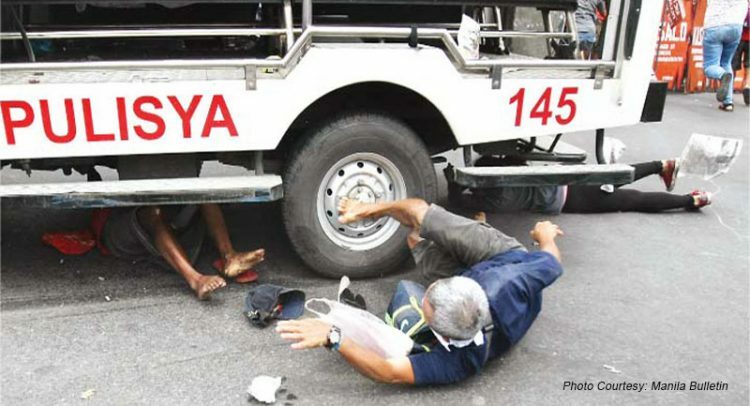 We, the officers of the National Council of Churches in the Philippines meeting on October 21, are saddened by the brute force employed by the police on the demonstrating national minorities. The use of a police mobile car to ram back and forth into the ranks of the demonstrators in an attempt to disperse them just when their activity was drawing to a close left scores of people hurt and a couple almost run over. We support the action of the Philippine National Police in sanctioning nine of the members of the police force as a positive step towards investigating the incident. This month is National Minorities month. A major activity of national minorities is Lakbayan where national minorities nationwide congregate in Metro Manila. This is the only time of the year when they do so to bring to the national capital region their concerns in their remote communities. They have highlighted their resistance to development aggression in their places especially the effects of unbridled mining by multinational corporations. This resistance has been met by the deployment of military troops in their areas. Consequently, these resulted in the disruption of their socio-economic activities. Some have been killed, others harassed and communities forced to evacuate. We commend some of our churches who provided sanctuaries to some of the evacuees and ministered to their needs. Even as we hope that the investigation into the deadly incident will proceed judiciously, we urge our constituents to discern the message being raised by the national minorities and the reasons they mass up in Metro Manila at this time of the year.